The decade of 90’s known to be rejuvenating era for music in Hindi Cinema. Hindi Film Music lovers from all over the world, refreshed by the welcoming return of melody in the music, composers, like Nadeem-Shravan, Anu Malik, A.R. Rahman and many more, evolved their own styles and patronage to form new trends in modern melody. This book is a compilation of some of the best song lyrics of this decade along with their Notation and Chords, to practice on your instruments. 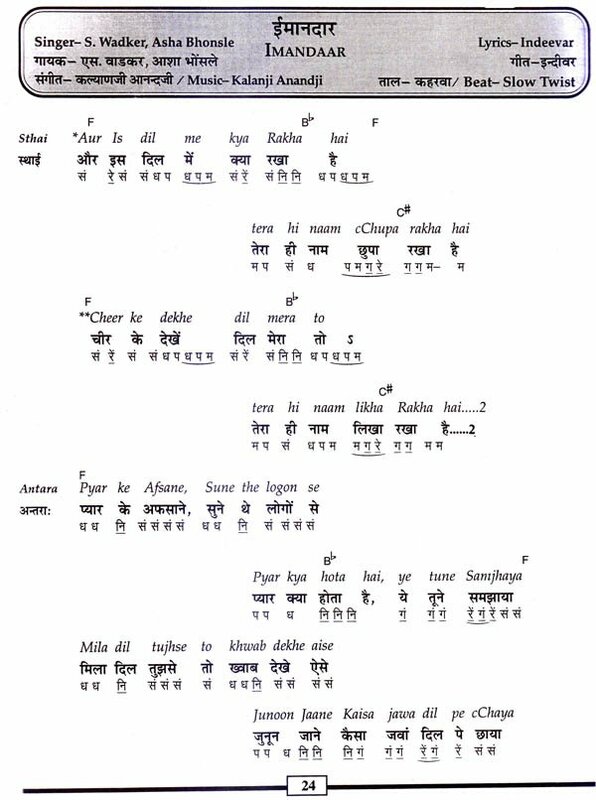 A real treat to the music lovers, the lyrics, the lyrics are not only in Hindi but also in Romanized form for the Non-Hindi Readers. Dear readers, we have compiled this book after a great research on the particular requirements of various music learners’ throughout the world. The book is the result of the loyal feedback of our regular readers and music learners. We have made the series a package for all kind of readers, whether they know Hindi language or don’t. 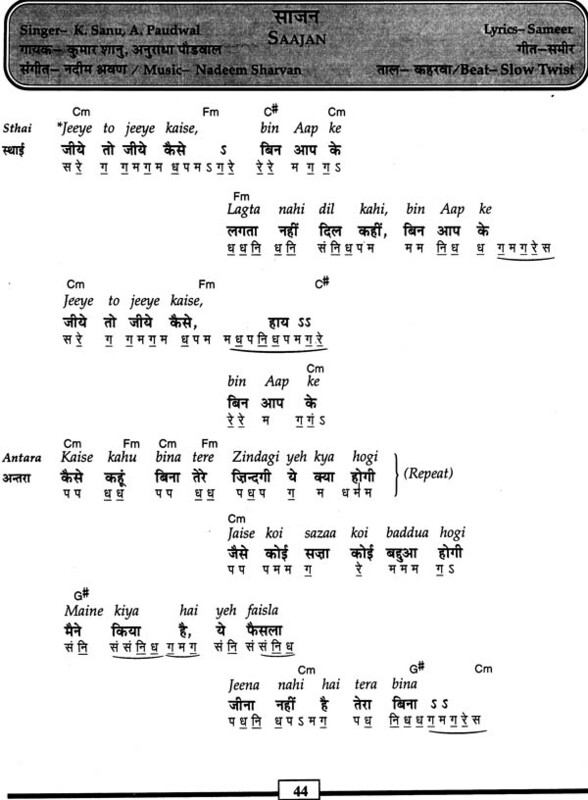 The book is written in two languages, Hindi and Romanized form of Hindi, i.e. Hindi written in English letters, to cater the vast group of people, who are great fan of Hindi film songs and don’t know to read the language, Hindi. Music and poetry are like air and water, the elements and emotions of life, they should not know any barriers of language and regions. 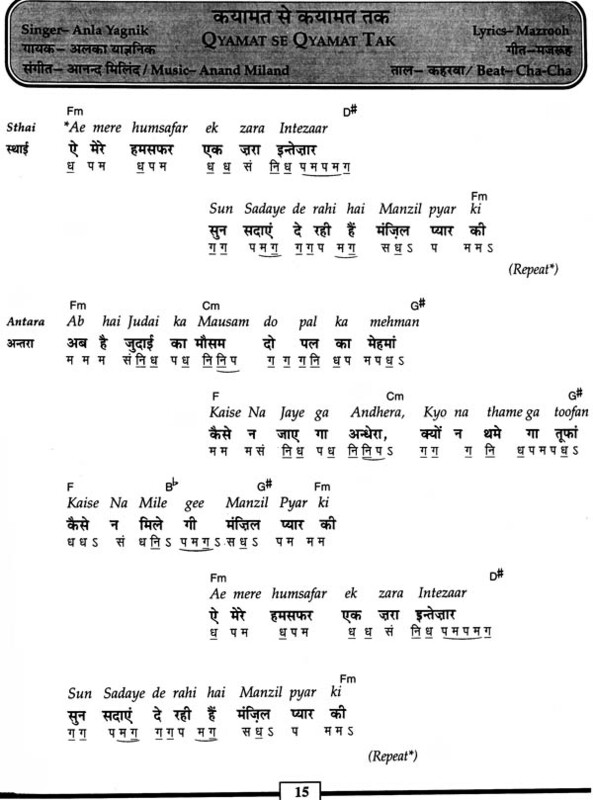 This is a well known fact that there are a plenty of people throughout the world who, without knowing the meaning, can sing a complete Hindi Song in a fine language. Our book is gift to all those expectations of people who ever wanted to have a collection of their favorite songs in the language they can read and hum along. Above all, it contains the notations of the songs in such a manner, that even a novice or a beginner can play his song very easily. The songs also contain the chords of Spanish guitar, that anyone who knows to play guitar can play his songs easily. Songs are the most common form of poetry, and with translation or conversion of poetry to any other language, disturbs its beauty. So it is always suggested to have a little knowledge of the language to understand the poetry written in that language. 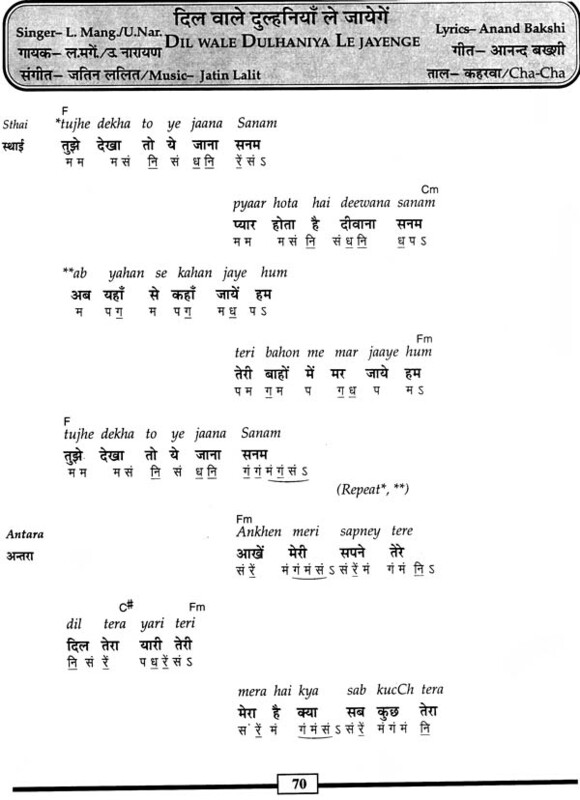 The language, Hindi is another beautiful language and it was a difficult task to convert songs in English letters, the way it does not loose its beauty. 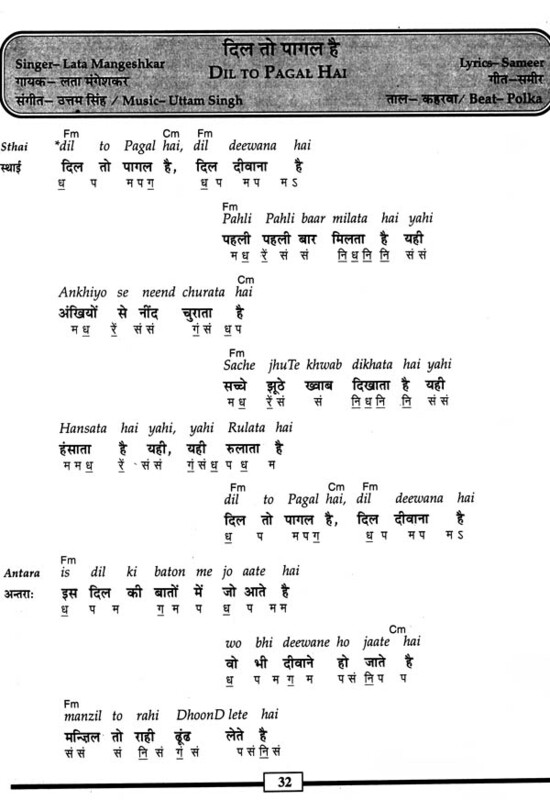 Hindi has its sound like vowels and vocabulary so that we have taken some liberty in writing the most equivalent letters of English instead of some typically pronounced Hindi consonants. We have given here some of these letters and their pronunciation. Mr. Balbir Singh, music teacher, musician and now a well known music director to the audiovisual media, belongs to the well known music family of Dehra Dun. Son of great violinist and vocalist of his times, Mr. Balbir Singh started learning from his father at an early age and became popular by his versatility and capability of playing more then 13 musical instruments with perfection. According to thousands his of students from his 50-years old music school, he is one of the friendliest teachers, who experiments the innovative styles of teaching music and made the typical subject easy to learn. S. No. Singer Song Film Page No.